It started innocently enough, but it didn’t quite end that way. I’m not sure I expected it to, though. 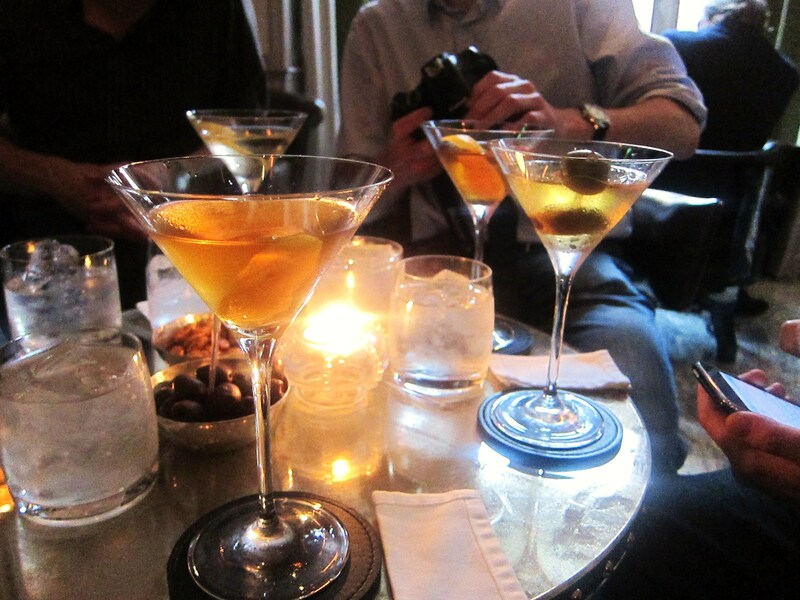 After all, when @jezmd and I hatched the idea of doing a “High Class Martini Tour” around some of London’s more noteworthy cocktail caverns, it could only end in loss of sobriety and, quite possibly, much more. I should start by saying that I’m not much of a drinker of spirits – wine has always been more my thing – but as of late, I’ve been trying to get my head, and my lips, around a range of liquors and cocktails that I wouldn’t have even been able to sniff five years ago without recoiling violently. I have a newfound appreciation of the nuances of single malt whiskeys (thanks in part to the resource otherwise known as @cowfish and the Scotch Malt Whisky Society, also on twitter as @SMWSLondon), as well as gin and vodka in their various guises. Anyway, @jezmd and I started bandying around ideas about this theoretical tour in the misty vapour of aptly named twitosphere and pretty soon a few others expressed interest. In the end, it was the two of us plus @chrispople, @essexeating and @vachonline who set quite an ambitious plan. Google walking maps were devised (you presumably already know I’m a geek), the stops of this whistle-stop tour were debated, and we finally arrived at that accommodating avenue called Consensus. My golden ticket for a WUI (walking under the influence) around London? The afternoon started off with yours truly meandering quietly through Golden Square, just across the street from our first target. 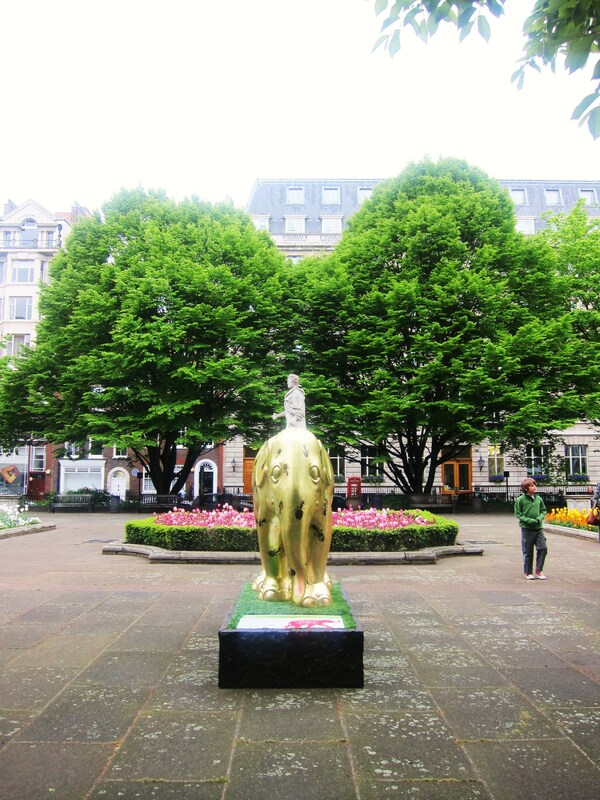 Strangely enough, I spotted a golden elephant in the golden square and thought this auspicious moment worthy of a snap. But fare forward, travellers – no time for chit-chat. I was late, I was late, for a very important date. Leonid (aka Bob [Bob]) had been kind enough to offer us a table at his deluxe deco diner, and had also generously offered to make our stay somewhat less of a (financial) burden, consummate host he is. 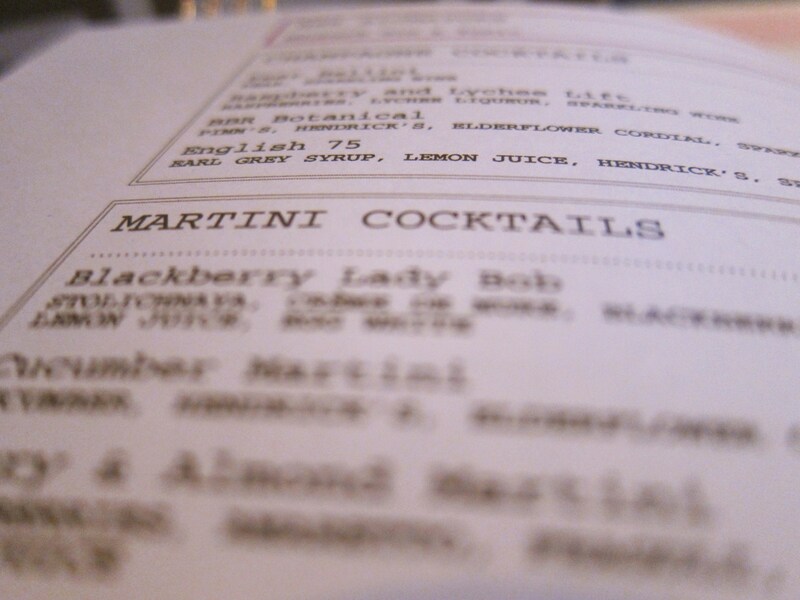 Therefore we not only partook in some Bob-tinis, but also ate some Bob-burgers (but no Bobcorn, mind you – and that one’s actually on the menu). Thus, we ordered our first round of drinks for the afternoon. Well, actually a few guys ordered a pre-first round of drinks, if memory serves me right. 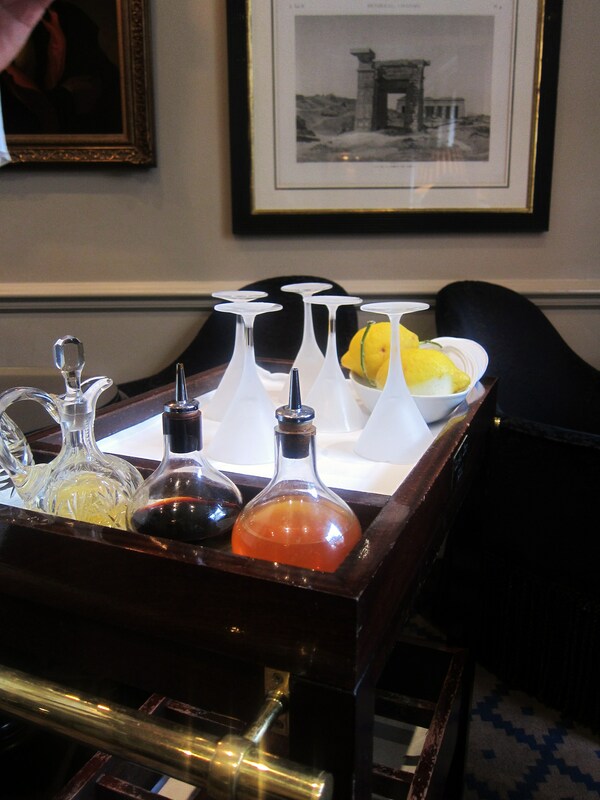 Chris had his eye on a perfectly translucent Bloody Mary (perhaps Bob let the vampires attack it before serving? 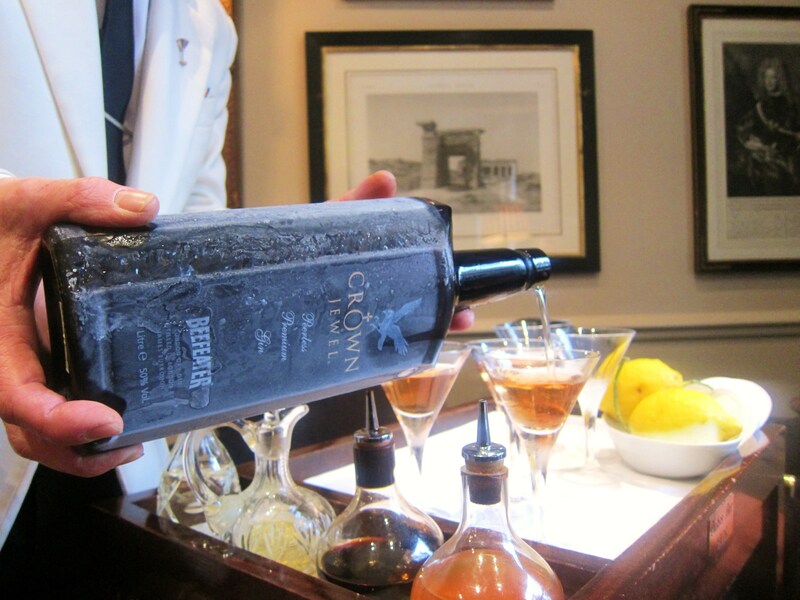 ), which I got a sip of and was…pardon me, I can’t help myself…bloody fantastic. I seem to recall Chris explaining that they exact the pure juices of tomatoes and let them extract overnight, or some such shenanigans – but the result is shockingly good, both for the shock of the lack of color and for the taste. 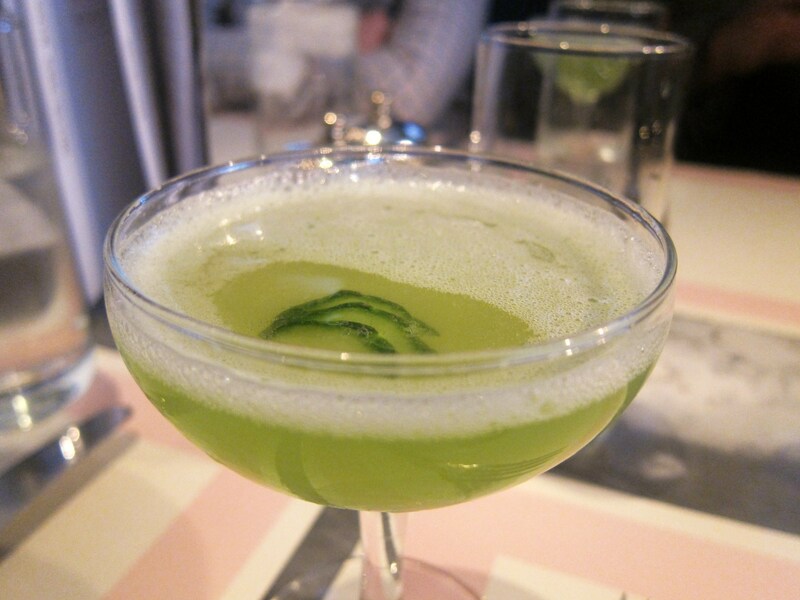 For my part, I ordered the Cucumber Martini, which is made of Hendrick’s gin (one of my widely available favorites), cucumber and elderflower cordial. It was okay, but I thought it a tad too sweet. I much prefer the rendition over at Dukes Bar, which is better balanced in my humble opinion. 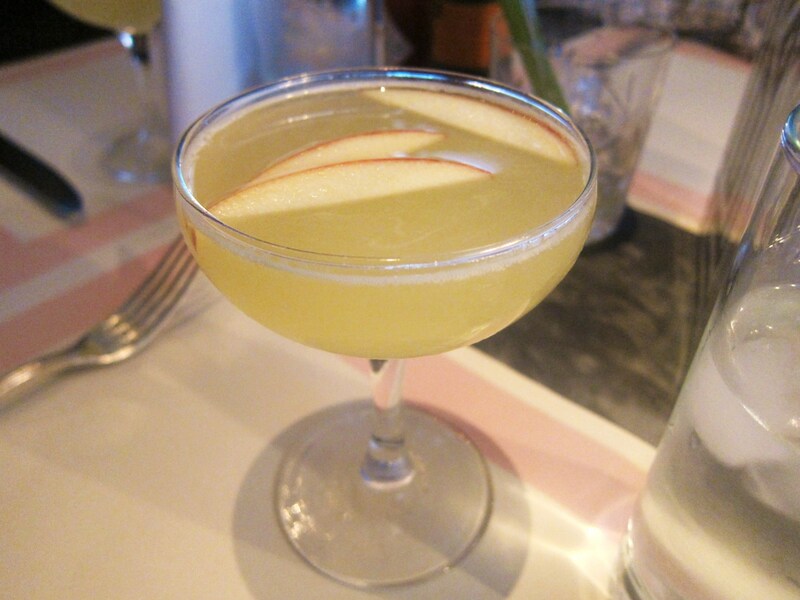 Others opted for the slightly more feminine allure of the Fresh Apple Martini, composed of apple, Manzana Verde, Zubrowka, apple juice and lemon juice. This was better and I was sorry I hadn’t ordered it. But that was not such a big deal, because food was on its way. Unlike so many other places around London, which publicly extol and actively market the virtues of their beef patties, trimmings and buns, Bob had kept his burger more on the down-low. 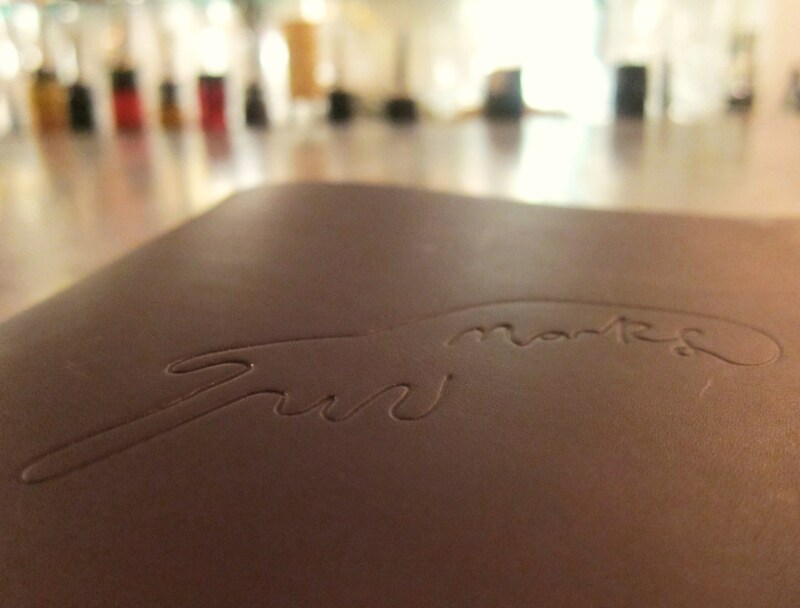 I can’t say I was surprised that it was good – most things I’ve sampled at BBR are pretty well executed and flavourful – but it was better than I had expected by a good mark. 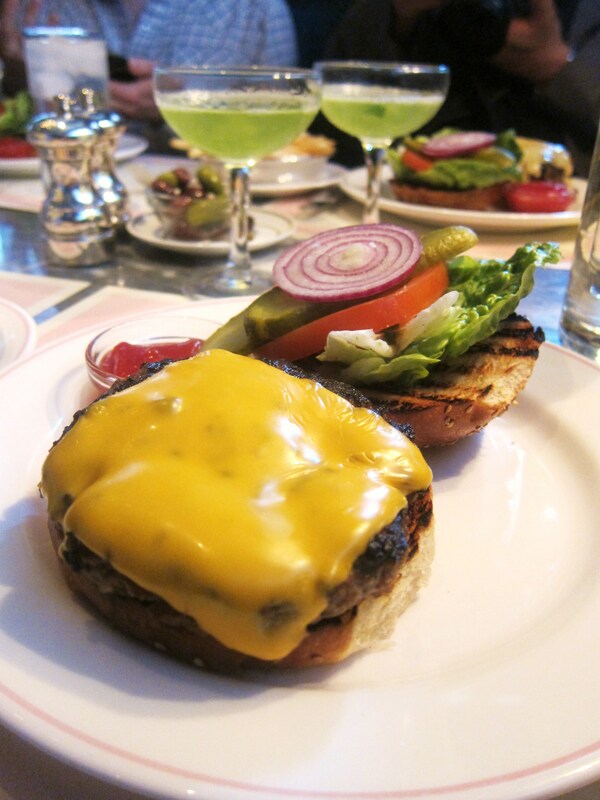 In fact, it was one of the better burgers I’ve had in London (it would probably make the top-5). Plus I love that he somehow sources Kraft Singles – which he said can sometimes be difficult – because it has that extra pang of nostalgia for me. At least he doesn’t tell you the ingredients of what’s in that nearly neon yellow-orange maniacal miracle of molecular mechanics, but you can find out here if you care to. 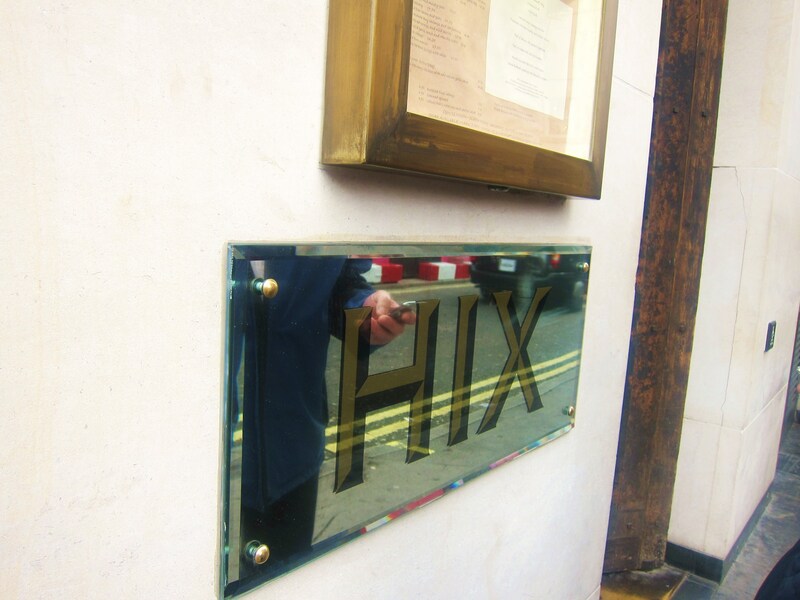 Yes, we arrived at HIX Soho a few minutes later, and some eager beavers were already checking in on foursquare – as you can see from the image below (alright, alright, so was I, so was I). A neon sign instructed us that the bar was downstairs. By the way, I think the neon artist in question is the same one who does the rather funky ones that adorn Bloomberg’s London offices. Once in the engine room, we lined up along the empty bar, ready to get this party started properly – no food this time, you see. I had never been here before and, while I liked the way the upstairs dining room looked (based on my 5 second peek-a-boo), I did find the downstairs bar slightly odd. It felt as muddled as one of their premium drinks: mostly modern with monotonous white tiled floor, glass walls, stainless steel bar, fairly random slimline chairs, and then a token gesture of warmth layered on top in the form of a pool table (too squeaky clean), an oriental area rug (which just looked odd), a few soft chairs, an old-looking leather couch and various other elements…suffice to say, it just wasn’t working for me. 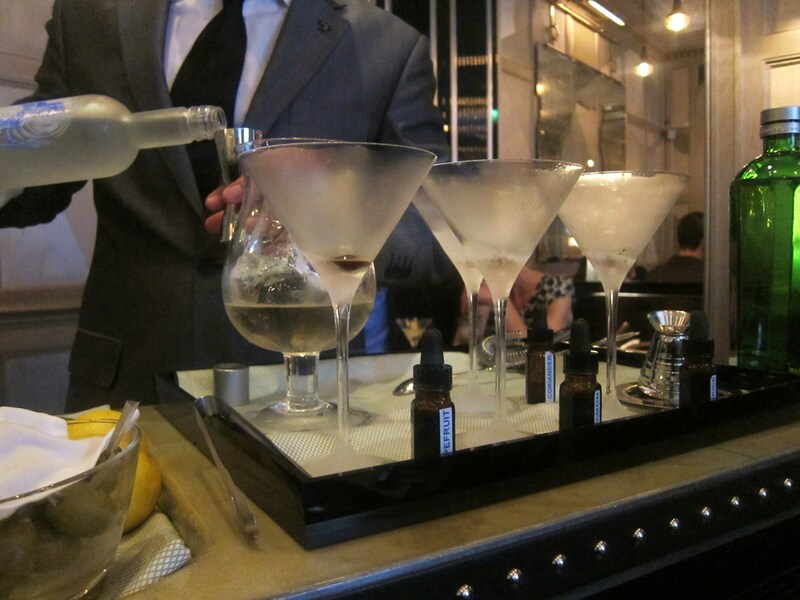 But hey, we were there for drinks, not décor, so we made our orders with the very professional looking barman. 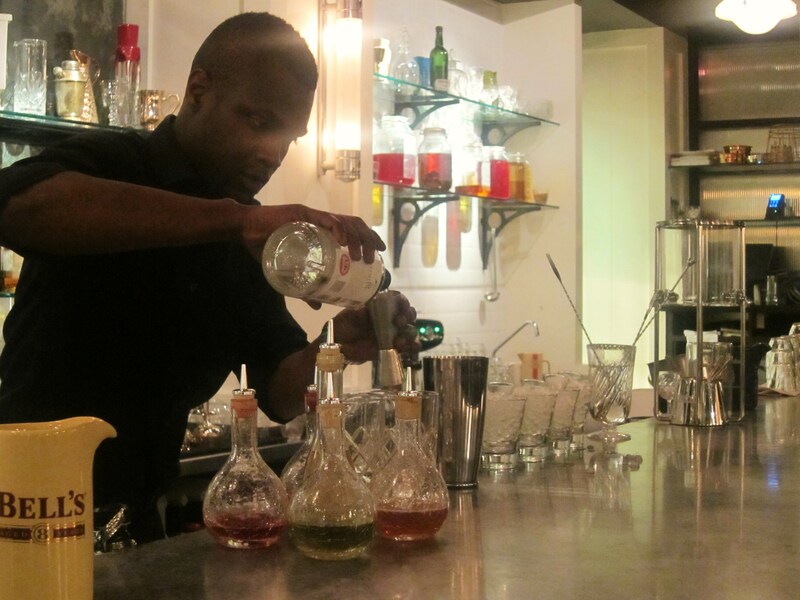 Said barman began preparing our beverages of choice. He was very silent and exacting, and took a very long time with them – so I was expecting something out of the ordinary. 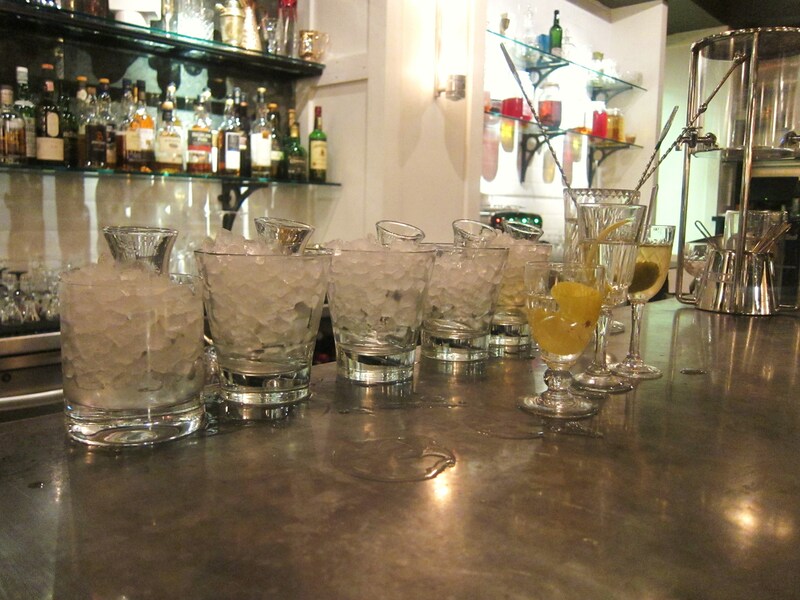 One nice touch at HIX Soho is that they serve each drink in its own unique vintage crystal glass. 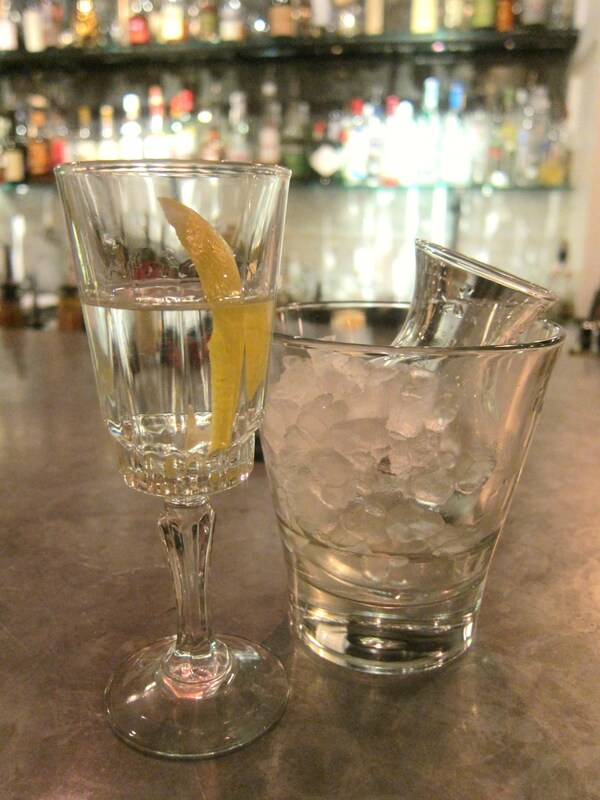 They also chill the rest of the drink in its own silver vessel, which lies submerged in a glass of ice. I generally prefer vodka martinis so that’s what I ordered. I thought it was okay, but it was simply too warm (despite all the ice?! ), and therefore didn’t work for me. The flavours weren’t bad but the temperature killed it. @Vachonline decided to get dirty on us, and his choice of drink is pictured above – I recall that he liked it but didn’t love it…and that seemed to be the general consensus here. 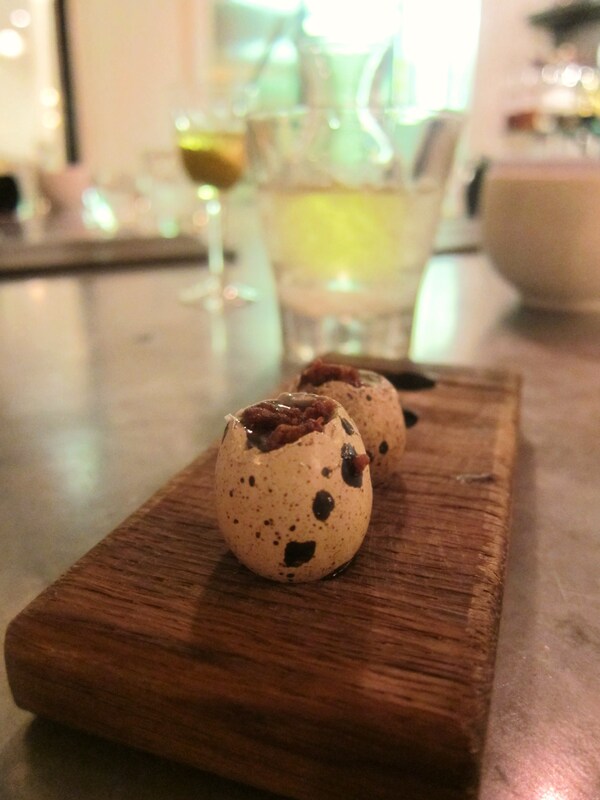 Some brave cowboy had decided to order some of their quail’s egg shooters – we had heard they were good (or strange, I can’t remember), and were therefore intrigued. Composed of the eggs (of course! ), streaky bacon, chives and sea salt, they were certainly odd and not completely appetizing for some reason. 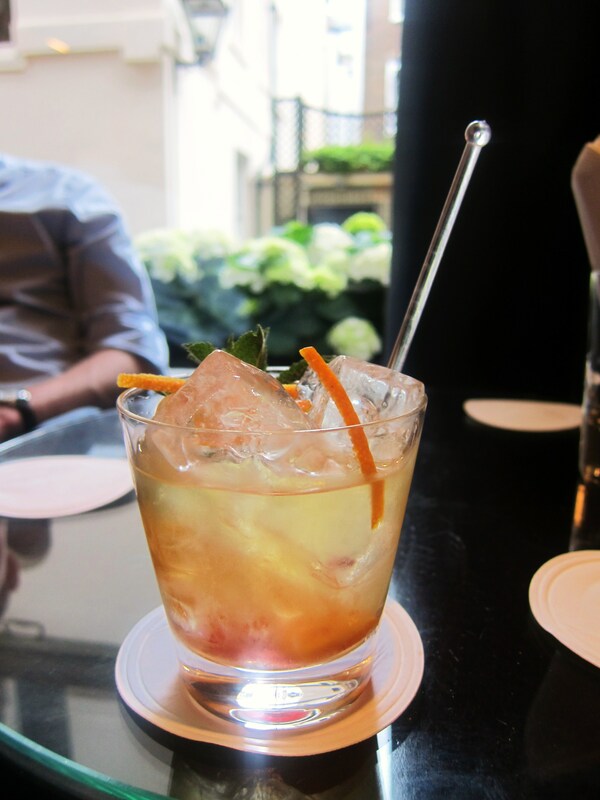 If you want more details (I don’t), you can see @gourmetraveller’s post on them, and other Hix creations. 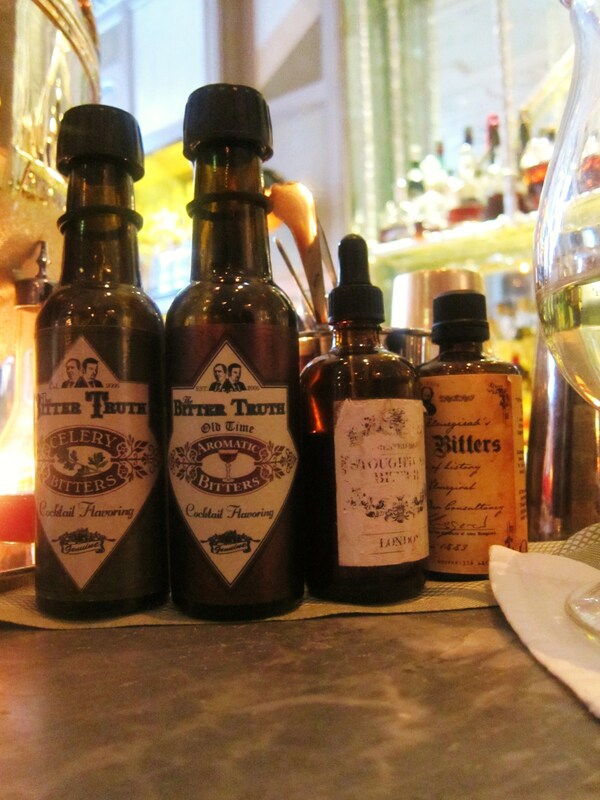 We left on that savory note and wound our way to the next station on the Tipple Express train. 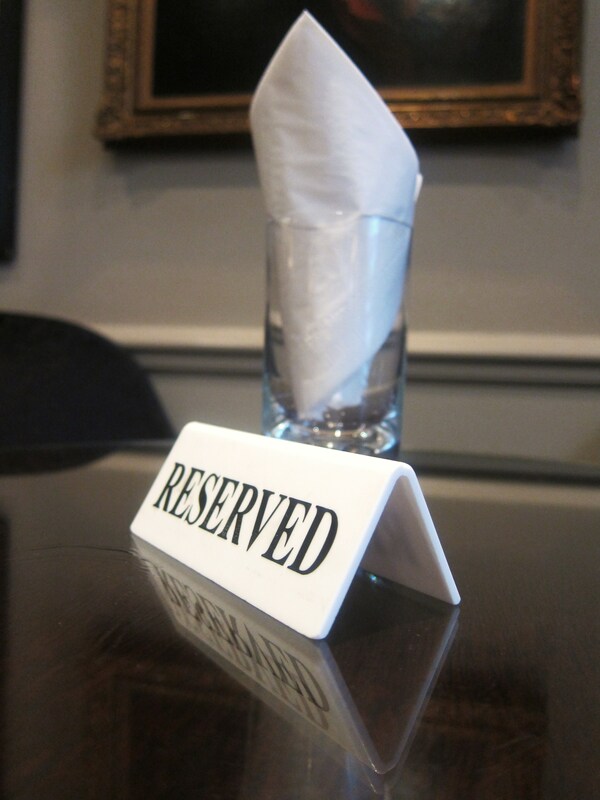 Our plans to visit another Soho haunt were scuppered as we weren’t able to wangle bar seats at Quo Vadis’ private members club. 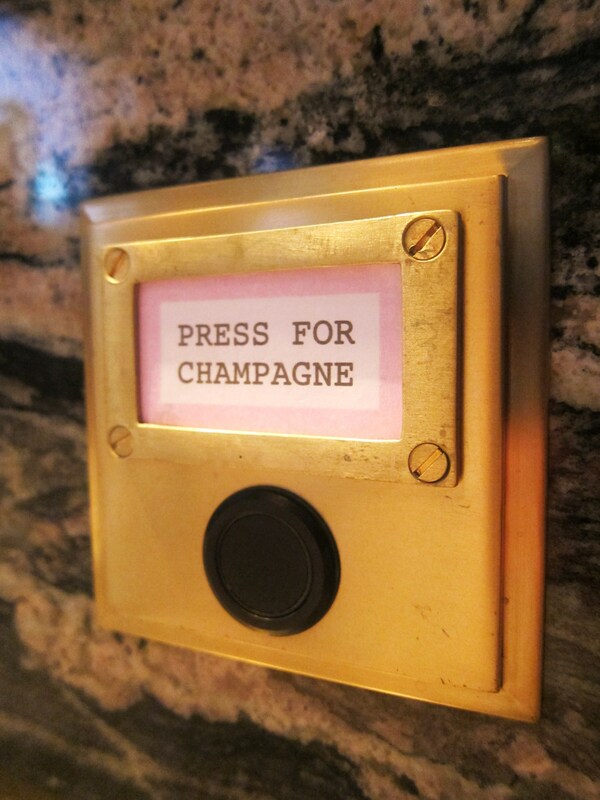 So we scratched that from our rapidly deteriorating memories and marched on to the posh backstreets of Mayfair. 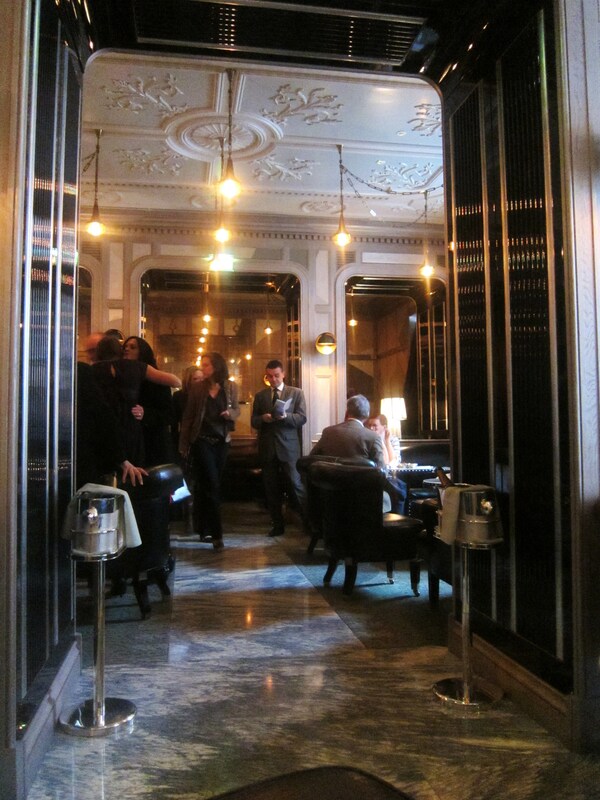 I was informally leading the gang to my own favourite martini hideaway, the serene surroundings of historic Dukes Bar. As we passed by another surreal looking elephant – okay, it probably didn’t look that surreal, but I had a fair amount of ‘spirit’ in me by that point – I couldn’t help remember the slightly terrifying scene from Dumbo (well, it is terrifying when you’re 5 years old!) 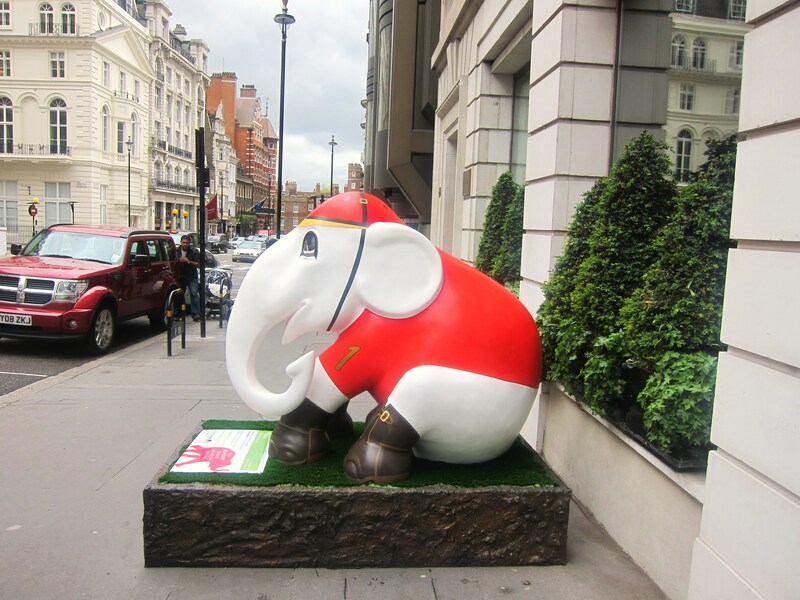 where the pink elephants are on parade – was I that little pink elephant leading the others? 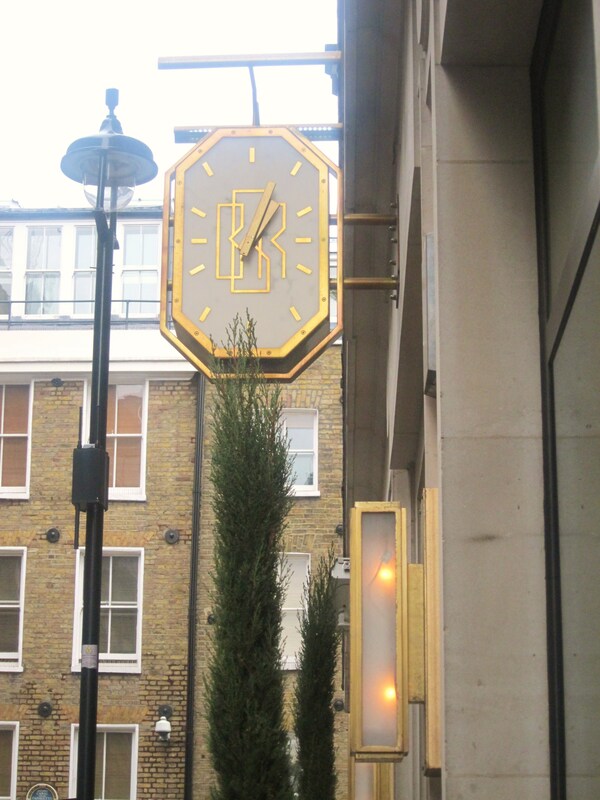 We were heading into a place whose denizens are mainly hedge fund managers and rich American businessmen. 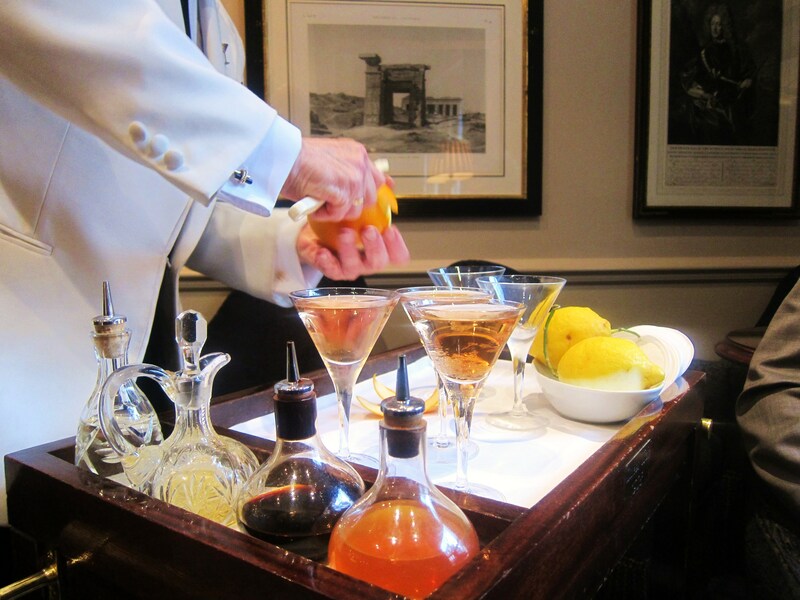 Yes, this is the place that supposedly inspired Ian Fleming for his “shaken not stirred” martinis, and they are quite simply the best I’ve had to-date, probably aided by the fact that they are served by the legend that is Alessandro Palazzi, my favourite barman in the world. So you can see I a biased…but not without good reason. (For more details, you can see a previous post on the place here). I had pre-warned Alessandro that we were coming and he assured me he would “take care of you boys”, so I knew all would be well, and all manner of things would be well. 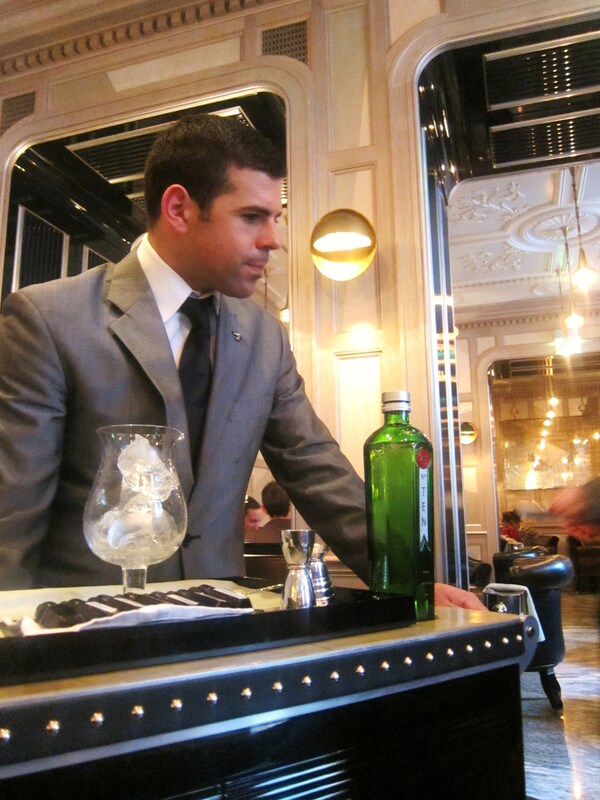 While this trolley doesn’t actually hail from 1908, the bar does, and they are famous for preparing your drinks in front of your eyes as you sit and marvel at their modest magicians. 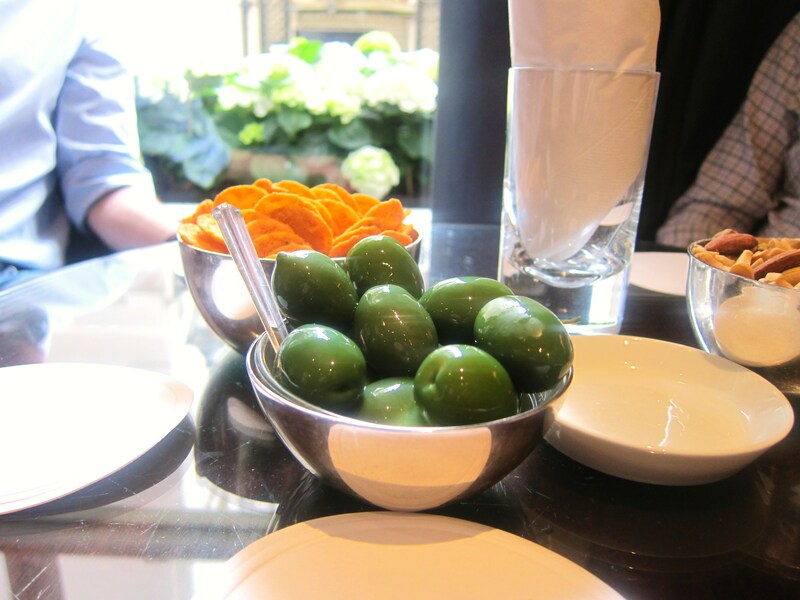 We were welcomed with the ginormous green Italian olives I have come to love, and also some silver bowls of salty crunchy things that taste great and make you want to drink more. 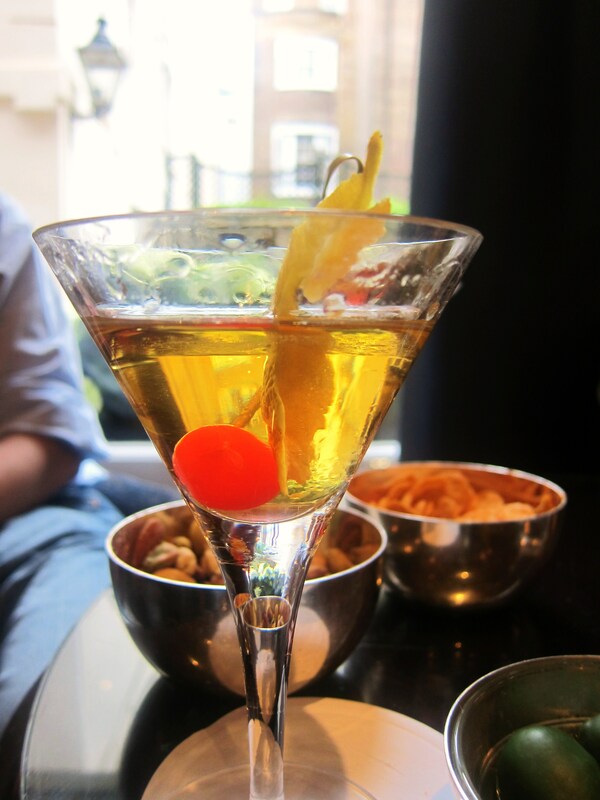 These are bottomless and come included in the (rather steep) price of a martini at Dukes. 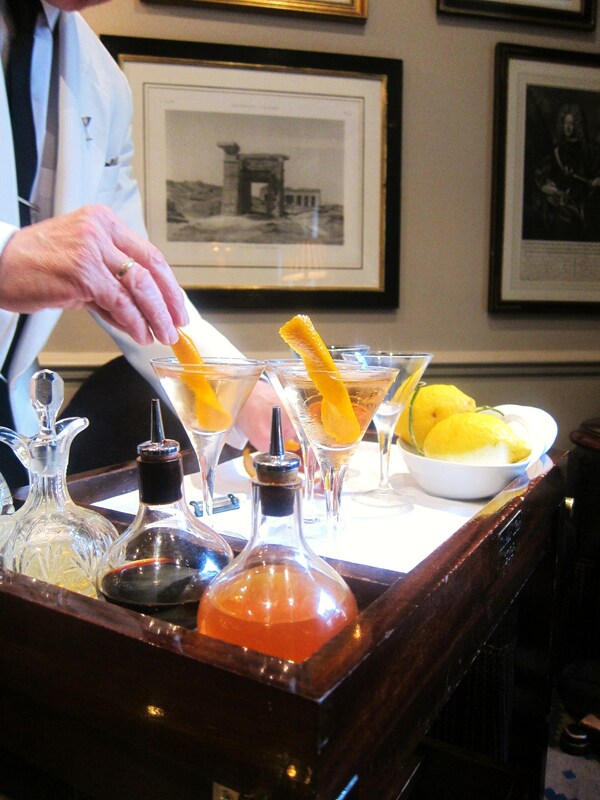 But let me tell you – and listen well – one Dukes martini will do more damage than two at most other places. 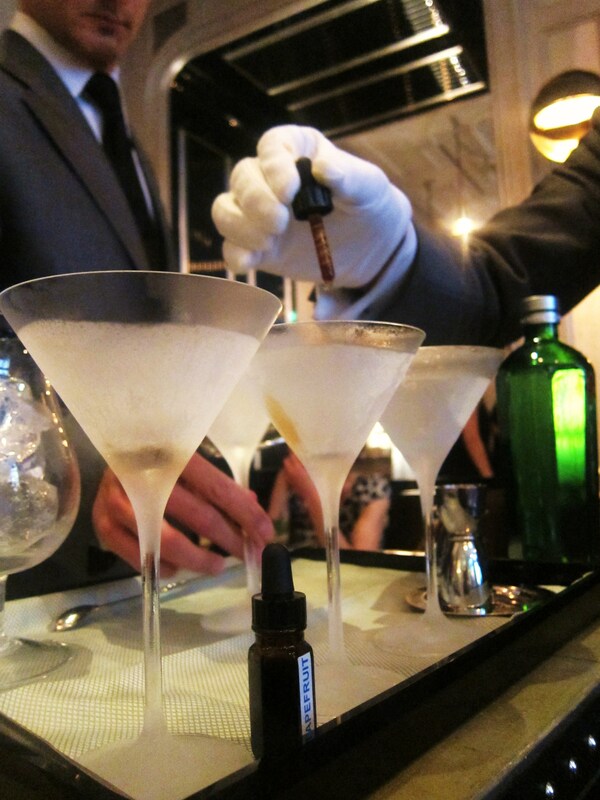 The Dukes martini is actually very simple in its conception, as are many of the best things in life. It all starts with frozen glasses. 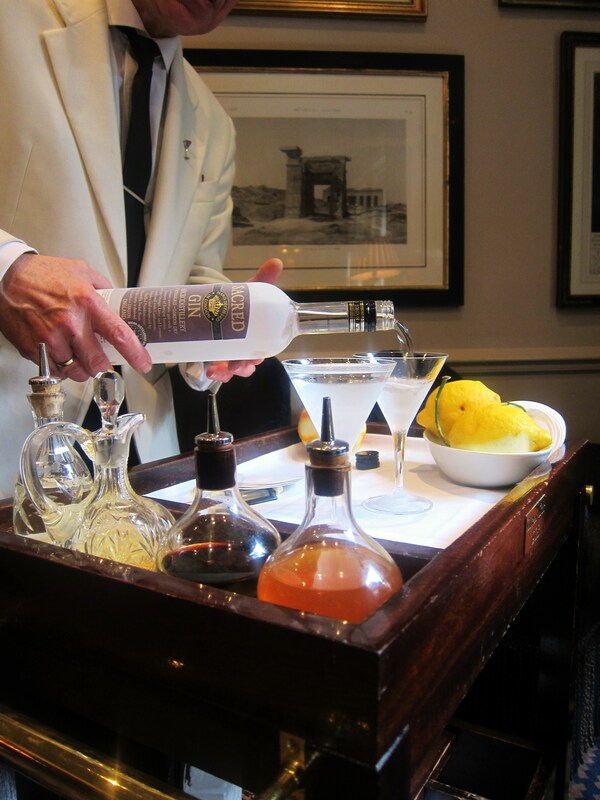 The vodka and gin are also frozen at a special constant temperature, ice is never used, and the martinis are never shaken (or stirred for that matter). As we nestled into our new surroundings, Alessandro entertained the gang with anecdote after anecdote about his favourite cocktails, a few of his secrets, his travels and other manner of things. 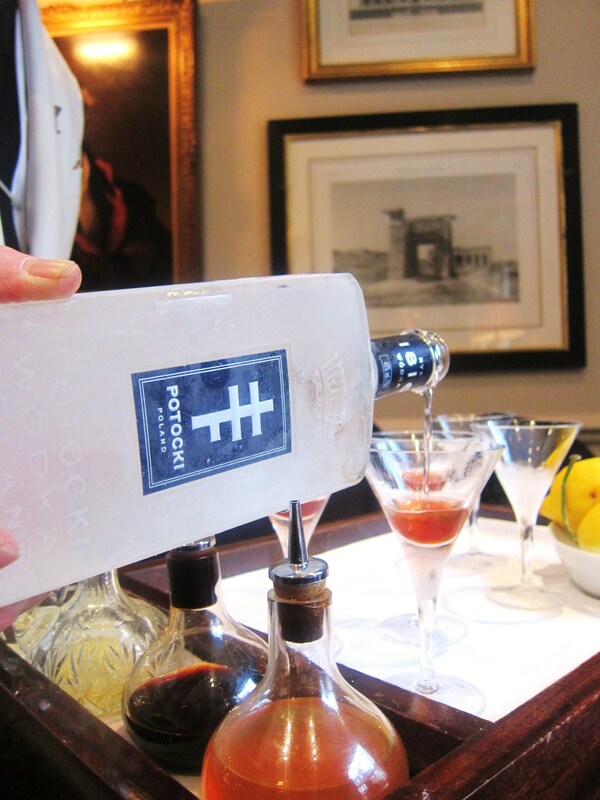 The vodka they normally use for their martinis is Potocki, which comes from Poland and purely expresses the charm and full flavor of that country’s rye. For gin, they often recommend Beefeater’s Crown Jewell which, as I understand it, has sadly gone out of production. 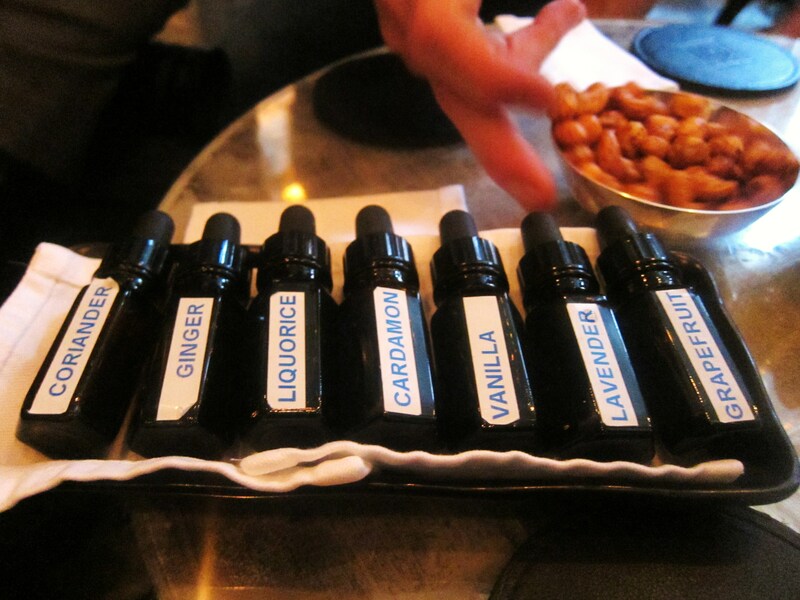 It is known for its intense aromas and also its very high ABV. 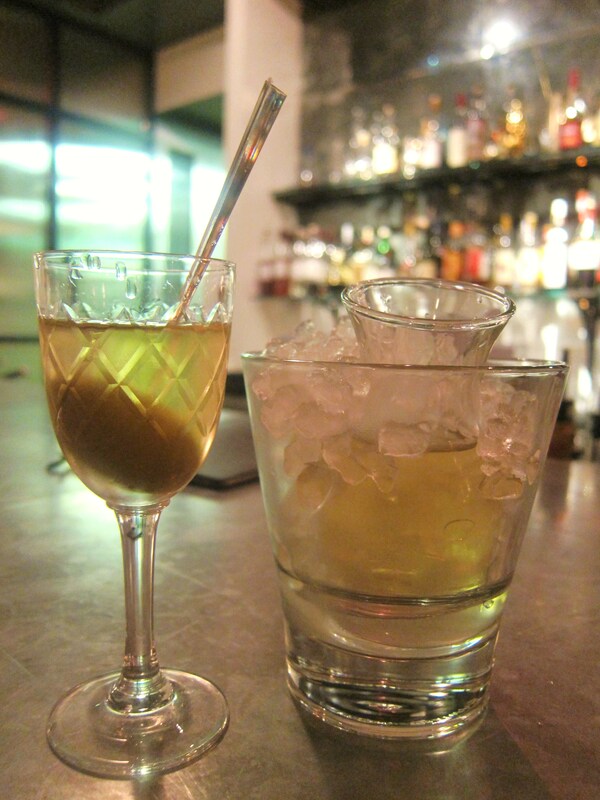 Some of us were starting off with the Dukes rendition of Ian Fleming’s Classic Vesper, which is made from the aforementioned gin and vodka, plus Angostura Bitters and Lillet. There are some secrets to this original version, but I suggest you get yourself down to Dukes and discover what they are for yourself as there are many (and generally not very good) pretenders to the throne. Alessandro put the final touches on our Vespers and we were off. 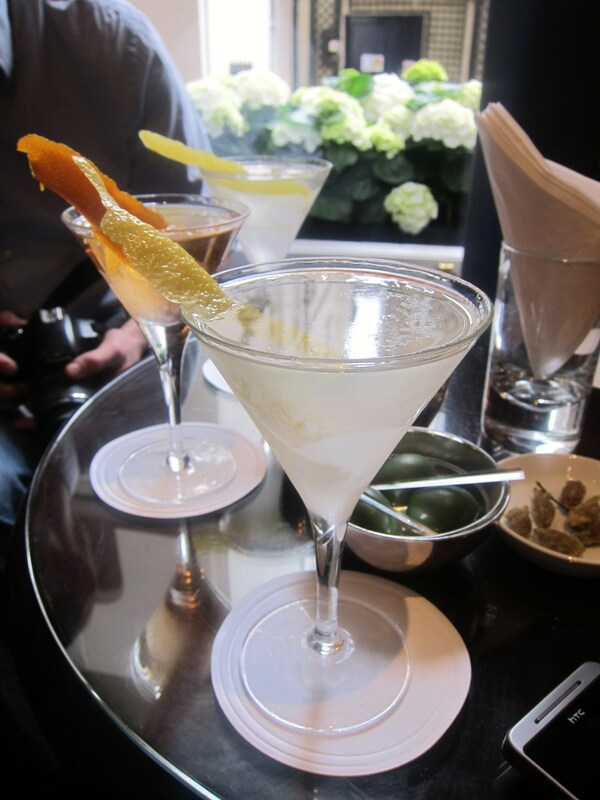 As we were having such an amazingly relaxed and enjoyable time, we went for a second round of drinks. 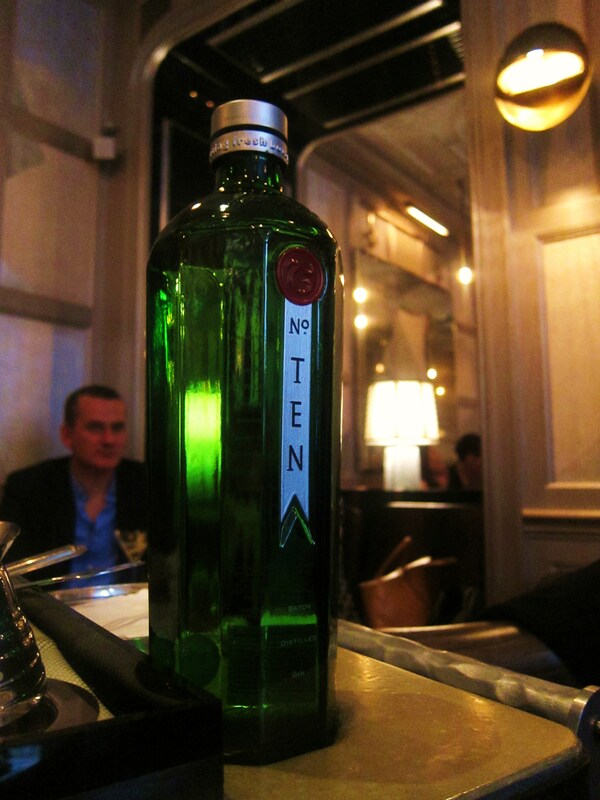 For this, Alessandro suggested the gin lovers in the group we taste one of his favorite newer gins to hit the scene. 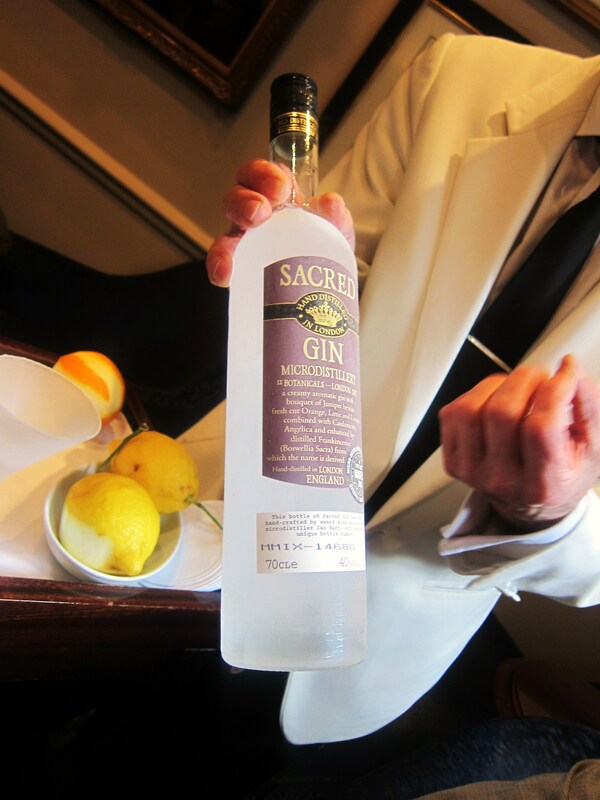 It’s called Sacred Gin and it is distilled by a guy named Ian Hart in Highgate (Norf London) in his own micro-distillery that is housed within, well, his house. I won’t say much, but I thought it was phenomenal. You should really read some of the articles on his website as it is quite an interesting story. After another hour or so of leisurely conversation and the revelation of a few of Alessandro’s secrets (see below), we decided we should be making our way, even though I don’t think most of us thought getting up was a very good idea at this stage. In my opinion, the drinks were – as usual – little short of astounding. They had wonderful balance, finesse and beauty, and I think most of my companions would agree (if not, speak up). We asked Alessandro who he reckoned were the best bar men (and women) in London, and after naming Brian Silva (who inspires even him), we really thought we should pay Rules’ bar a visit. 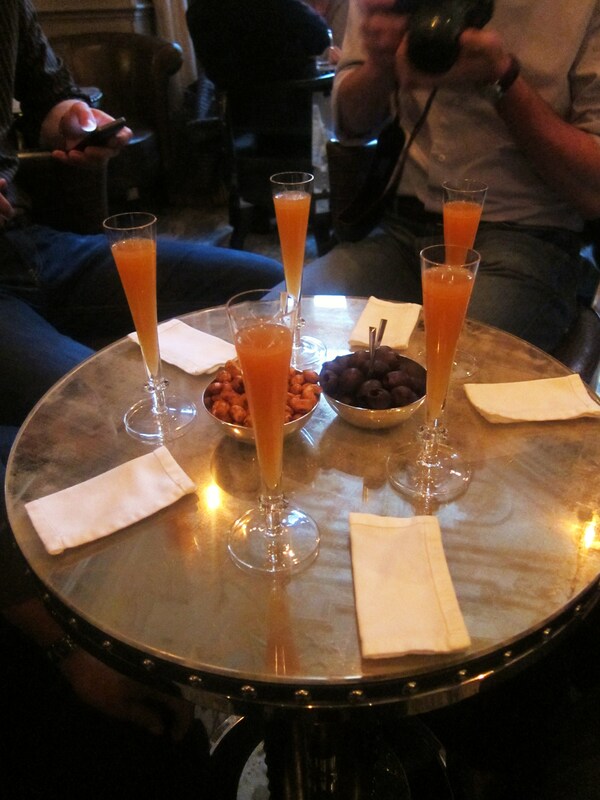 But sadly Brian wasn’t there on that day, so we opted to traipse over to Alessandro’s other recommendation, “The Bar” at The Connaught. As he is quite friendly with them (hey, they’re also Italian), he called ahead for us and made sure we had a seat…he also asked them to “take care of these boys”…you’ve gotta love this guy! As we crisscrossed the fine streets of Mayfair, we minded the sign on the side of the pedestrian crossing leading up to The Connaught – what is it with this country and its road signs? 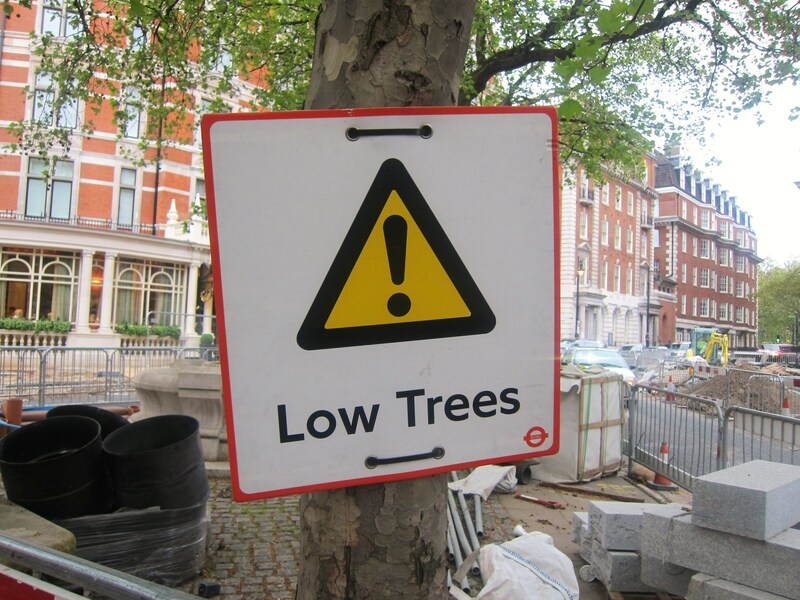 How could a pedestrian need to mind a ‘low tree’, and it wasn’t even low to begin with?! 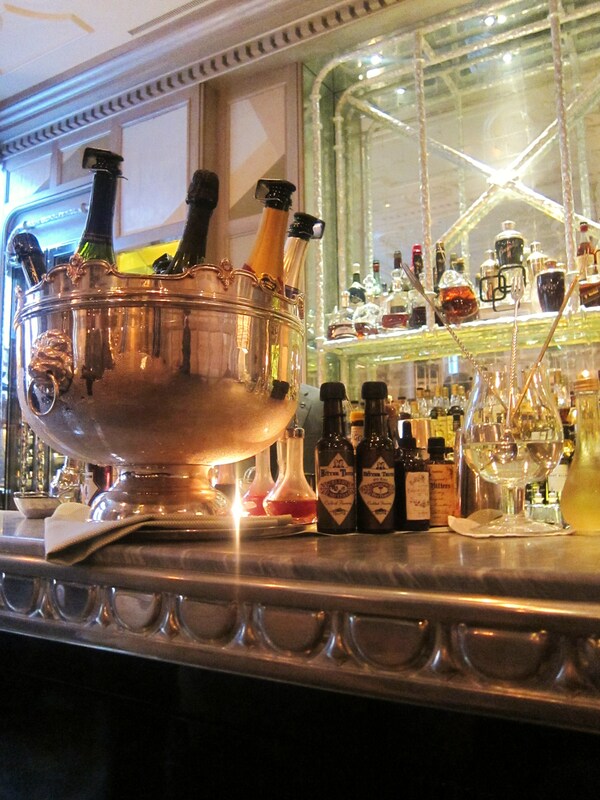 Okay, this bar was, in a word, bling. This is where you’d take a girl for a drink if you wanted to impress. Somehow we didn’t quite fit in, but we weren’t in a state to care about that at this point. We just wanted our drinks. 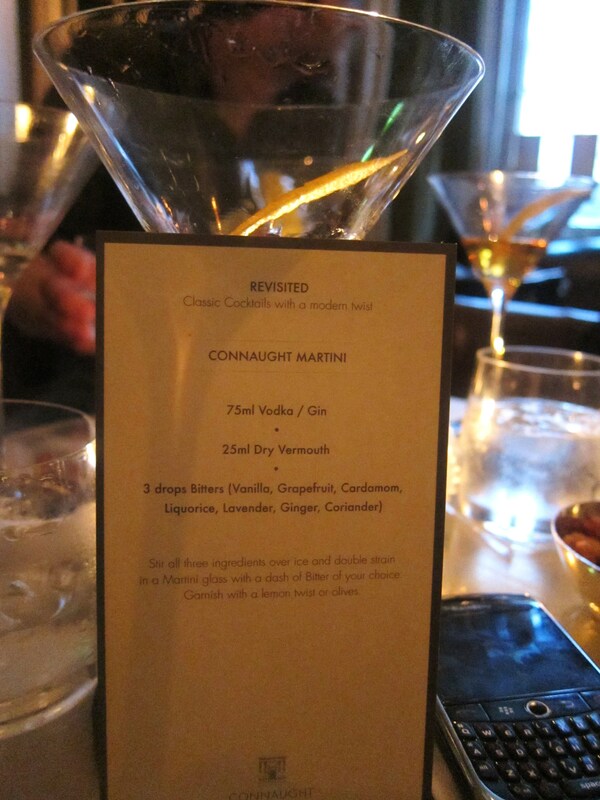 The Connaught was so refined, we even got a liquid amuse bouche before our drinks were prepared. I vaguely remember it was fruity, refreshing, nice and not alcoholic. 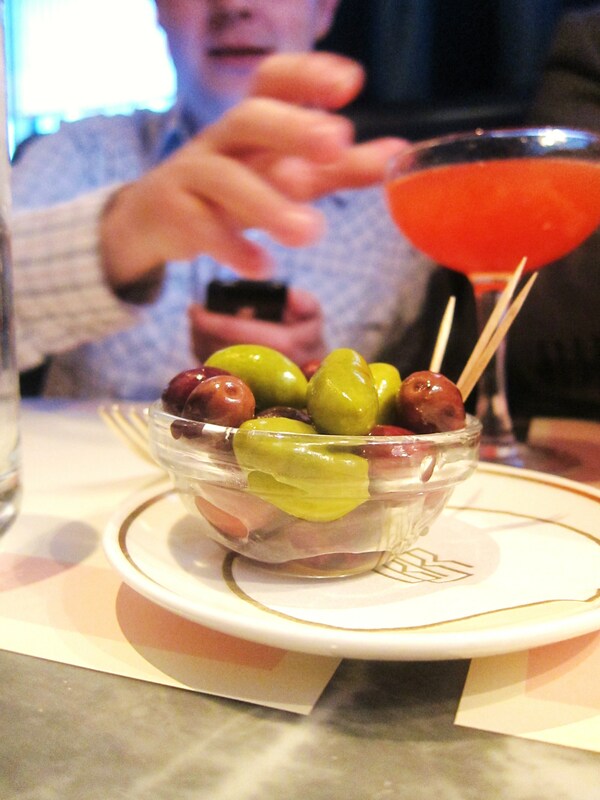 The munchies were also good, sweet roasted nuts and black pitted olives, although no way as good as those monster green Italian olives at Dukes. What am I going to do with these lowlifes? The exceedingly professional staff must have been in quite a quandary with our motley crew occupying prime position at the dinky round table smack-bang in front of the bar. Therefore, they decided to poison us. But at least they had the good humor to let us choose our particular poisons. I seem to remember for some inexplicable reason that I went for grapefruit and vanilla…and I’m meant to have a palate. 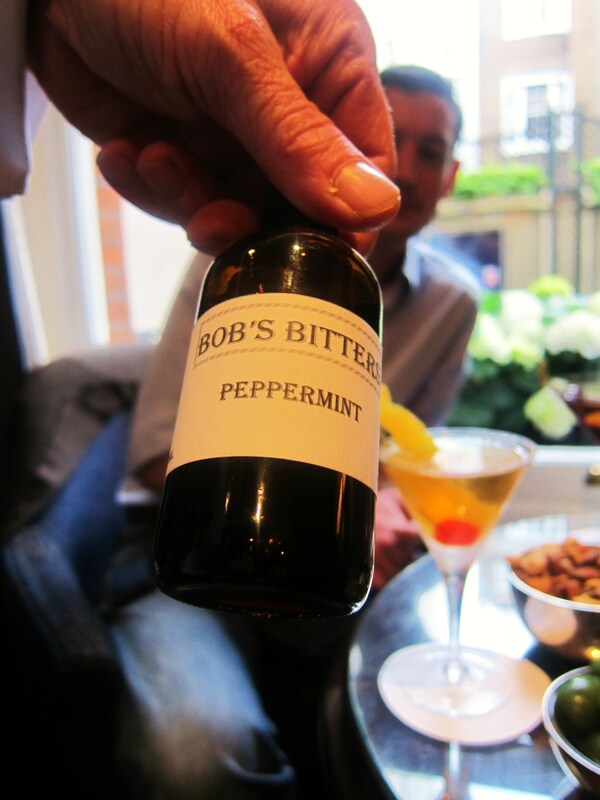 At The Connaught, they shunned Bob in favour of these bitter bottles. 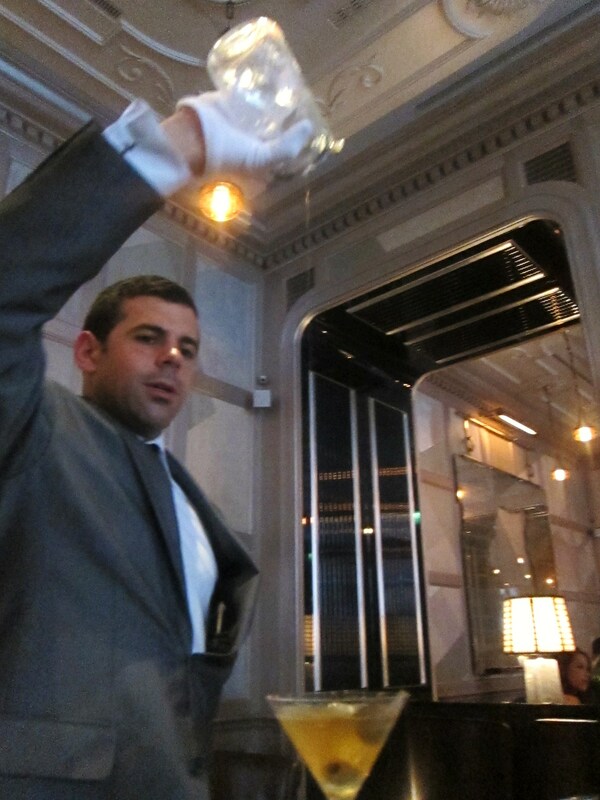 They do take their drinks very seriously, and even donned white gloves as they carefully measured out the dosages. They also seem to really like Tanqueray No. Ten, but I didn’t have it as I opted for vodka. They then fiddled around with the other necessary components. Then a bit of a high-wire show. I didn’t get a great shot of the drinks, but they were very pretty. In a nice (if slightly corny) gesture, they let us take a recipe card home with us so we could try it for ourselves. As I said, they certainly take their cocktails seriously here, but somehow it was lacking in soul – it was almost as if they were trying to show off how good they were, rather than allowing their guests to discover this slowly for themselves over the course of a few drinks – which I much prefer. 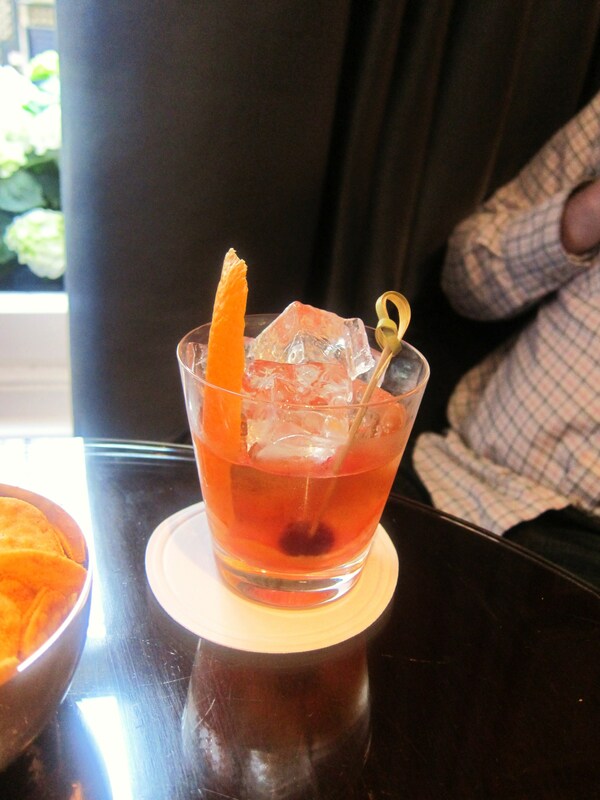 After paying up, we stumbled out back onto the surprisingly bright streets of Mayfair and headed our own ways , vowing to organize a “High Class Old Fashioned Tour”, on the back of the outstanding Old Fashioned(s) served up at Dukes. Long live these libations, I say. 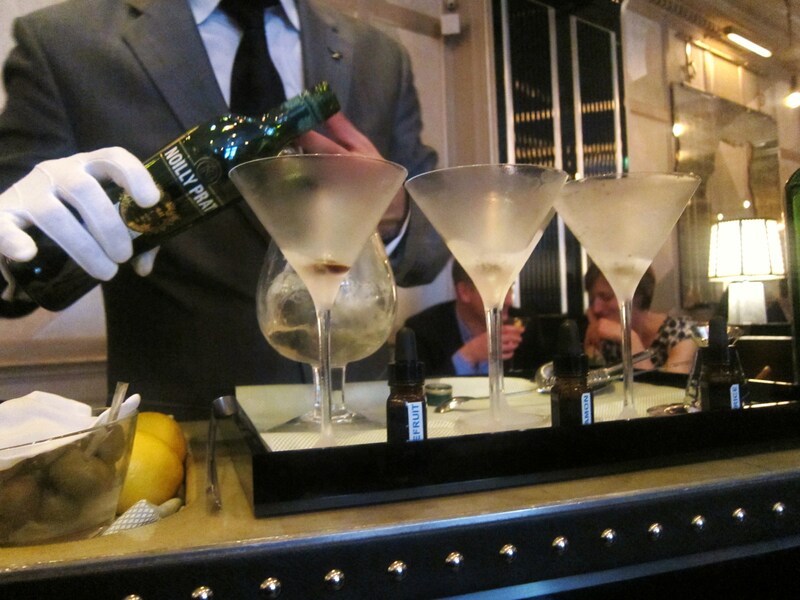 This entry was posted in Laissez Drinks and tagged Alcohol Tour, Angostura Bitters, Bars, Beefeater Crown Jewell Gin, Bloomberg, Bob Bob Ricard, Cocktails, Cucumber Martini, Dukes Bar, Fresh Apple Martini, Hamburgers, Hendrick's Gin, HIX Soho, Kraft Singles, Lillet, London, Martini, Martini Tour, Noilly Prat, Old Fashioned, Potocki Vodka, Quo Vadis, Rules Restaurant, Sacred Gin, The Bar at The Connaught, Things You Probably Shouldn't Do, Vesper Martini by laissezfare. Bookmark the permalink. 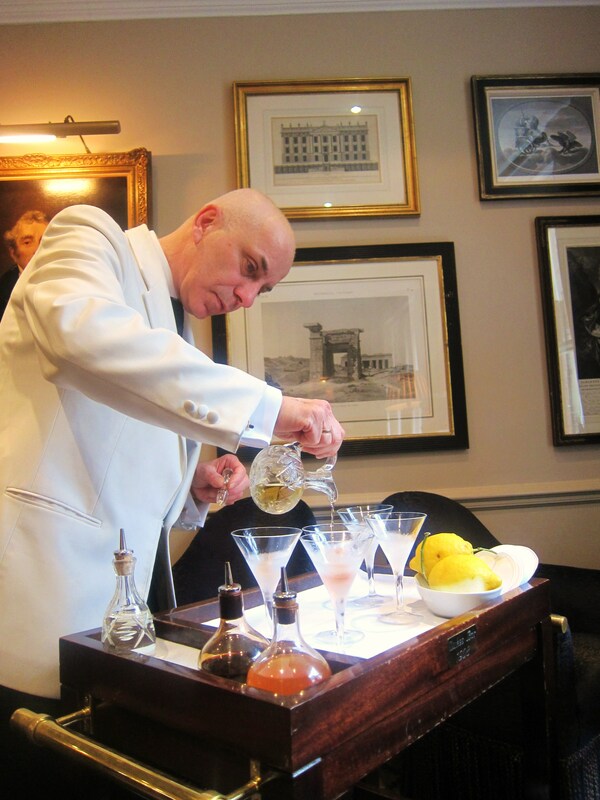 Wow LF – sounds like quite the boozy adventure – love the whole idea of the martini tour – perhaps you should set it up as a professional enterprise if only you were not deserting London! It was quite fun, I do have to admit! The ridiculous thing is that the other people in the gang are actually much more experienced and expert in the area of cocktails than yours truly, so maybe they should pick the venues and I should do the logistics :). 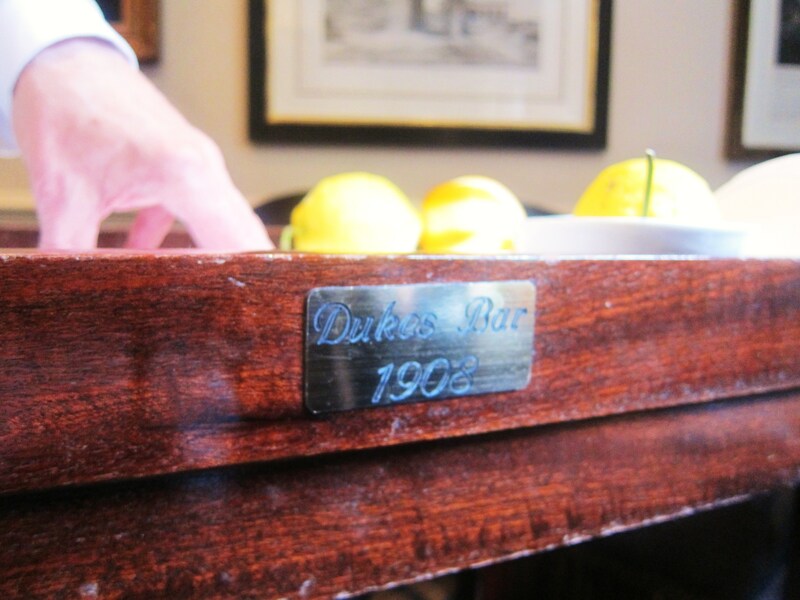 But I do love having a drink at Dukes. Can’t belied D-Day is getting so close…only a few more weeks in my adopted city. Will try to make the most of it – exciting dinner planned tonight! Sounds like a (much more) upmarket version of the Circle Line Pub Crawl we had in university days! Basically went around the Circle Line and was supposed to make a stop at each station and have a pint at a nearby pre-designated pub. Never finished it. Hehe, yes, I suppose so (I had never heard of the Circle Line Pub Crawl)! 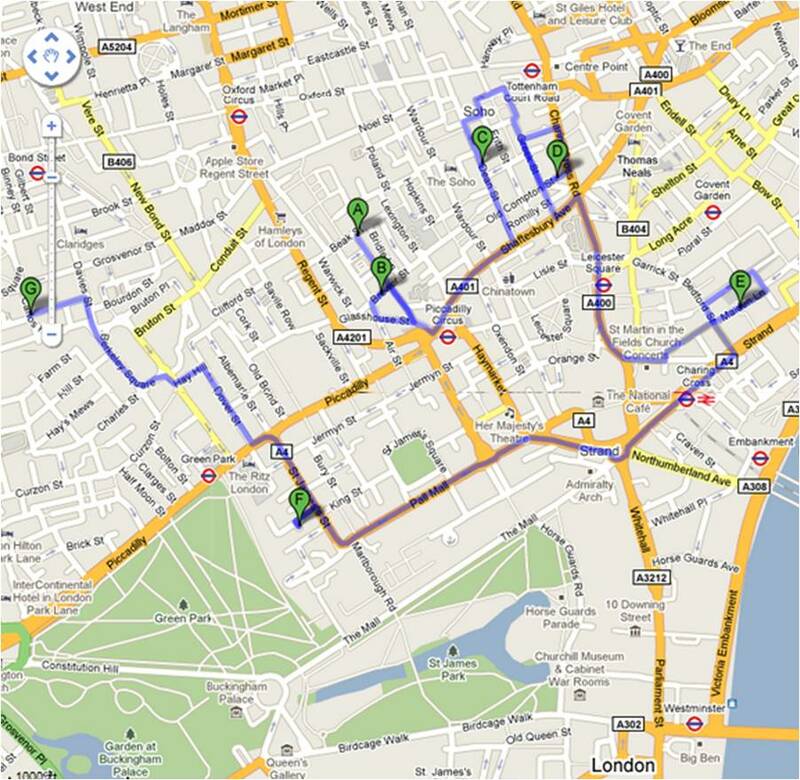 It was a nice trip around part of the West End and Mayfair. What a superb little trip; enjoyed reading and while I don’t get to London that often I will certainly try out Dukes. 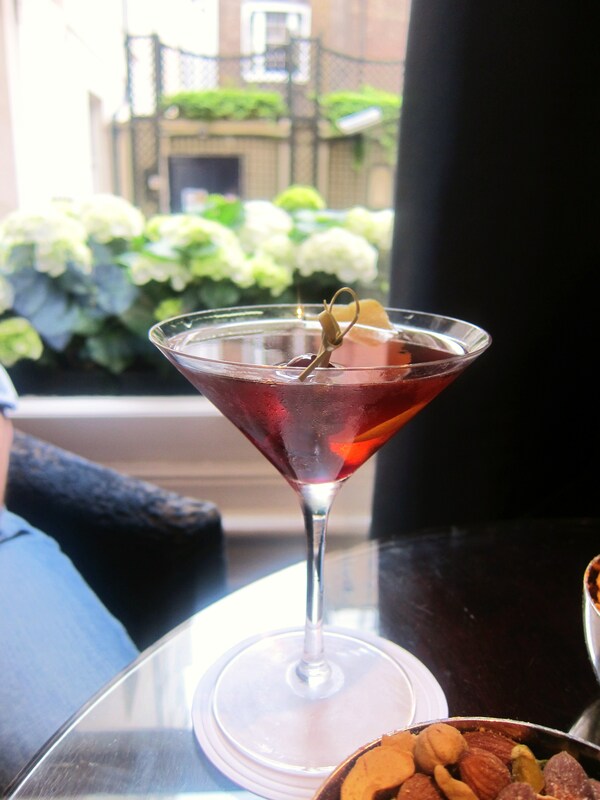 Thanks for dropping by – yes, I would definitely recommend a Martini at Dukes – try to sit at one of Alessandro’s tables if you can (and if he’s there).